Tomorrow, one of the National Postal Museum’s most interesting objects is being commemorated with a U.S. postage stamp. During his lifetime, a scruffy mutt named Owney was the nation’s most famous canine. From 1888 until his death in 1897, Owney rode with Railway Mail Service clerks and mailbags all across the nation. 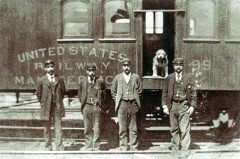 The Railway Mail Service clerks adopted Owney as their unofficial mascot, marking his travels by placing medals and tags from his stops on his collar. By the early 1890s, the traveling postal dog was a regular feature in newspapers across the country as Owney visited town after town. Owney’s unusual life and wide-spread travels have inspired several children’s books. Elementary schools across the United States continue to use the story of Owney as a way to connect their students with those in other states by sending stuffed toy dogs from school to school through the mail accompanied by messages from students to one another. When he died in 1897, the postal clerks refused to bury their beloved mascot. Clerks across the country asked that the dog receive the honor they considered he was due by being preserved and presented to the Post Office Department’s headquarters. Owney was kept on display there and then sent to the Smithsonian Institution in 1911. Pingback: New Postal Stamp to Honor Owney, The Post Office Dog – Huffington Post | Dogs Blog Site! TYPO: Smithosonian…is incorrect. The institutions name is spelled: Smithsonian. Your variation has an extra “o”.